In this tutorial, we are going to discuss GameStates, which we will use to implement a 'start on touch,' pausing, and restarting. 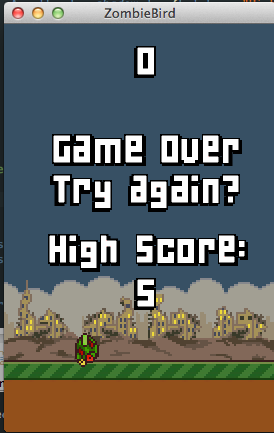 Then we will make use of the libGDX preferences to keep track of the high score. 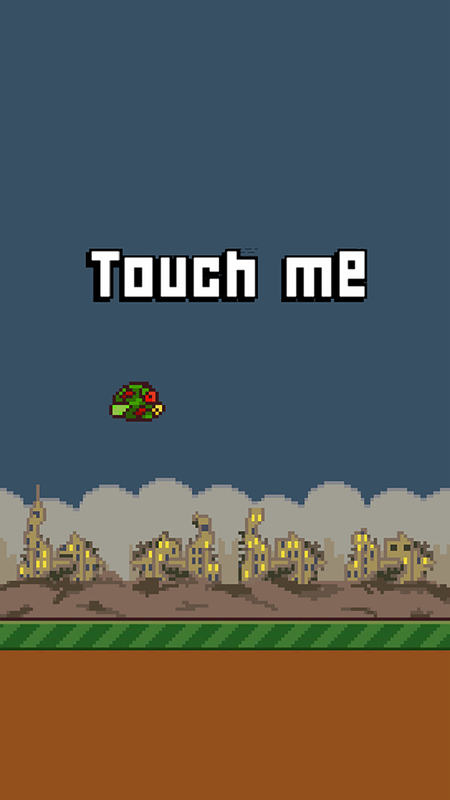 At the end of Day 10, you will have a fully featured Flappy Bird clone. In Day 11, we will add our final touches, adding splash screens and etc. Then we will move on to Unit 2, where we will add the most requested features such as AdMob and Google Play integration! If you are ready, lets get started. Forgot to add ceiling collision for our bird. Update the update method inside the Bird class! The idea behind GameStates is to divide our game into multiple 'states' such as "RUNNING" or "GAMEOVER". 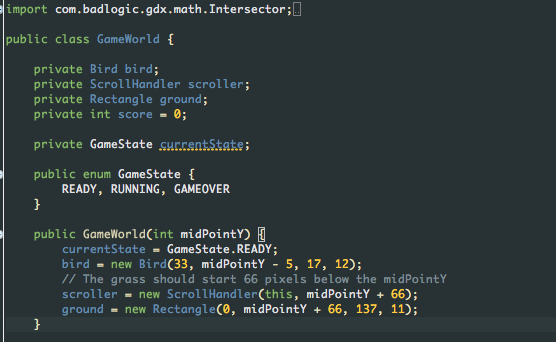 Then we will use if statements or switches to control the flow of our game depending on what the state is. An easy way to implement GameStates is to create an Enum, which is just a variable that can only take certain values that have been defined for it. I will let you read up on that here, if you are interested. If you prefer to see the code, keep reading! We next need to make a couple of changes to our update method. In fact, we are going to change its name to updateRunning. The update method now checks the current state of the game before determining which more specific update method to call. And finally, add these various methods, which will handle GameState changes, restarting, and so on. isReady simply returns true if the currentState is GameState.READY. start changes the currentState to GameState.RUNNING. restart is a more interesting - it resets all the instance variables that have changed since the game started! This is how we will handle restarting the game. When the restart method is called, we will cascade down to the other objects and call their onRestart methods. The result should be that every instance variable that has changed throughout the flow of the game will be reset - like dominos. What are the arguments that we are passing into the onRestart methods? These are all the initial values of variables that may have changed when our game was running. For example, our Bird's y position may have changed, so we pass in the original y position. We also need access to the midPointY, which is currently not being stored as an instance variable in the constructor. Let's change that. 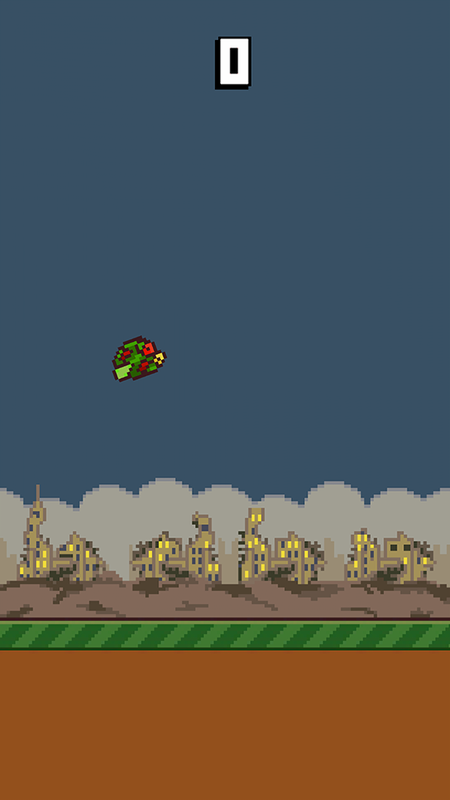 We will now add the onRestart methods to our Bird and Scroller objects. Let's start with the easier one - the Bird object. We must now go to the ScrollHandler class and create a similar method, resetting all the instance variables of the ScrollHandler class! Notice that we call some more non-existent onRestart methods. We will go deeper and complete them all. And we are done! Let's look back at what we've accomplished. We started by adding GameStates in the GameWorld class. We then added a restart method, which asked Bird to restart and ScrollHandler to restart, which in turn asked its three Pipe objects and two Grass objects to restart. Now all we need to do is let the game know when to restart. // myBird now represents the gameWorld's bird. - Don't forget to import! // Ask for a reference to the Bird when InputHandler is created. Of course, since we changed the constructor for our InputHandler, we need to update our GameScreen, where we initialized the InputHandler using its constructor. Our restarting code is setup! Now when the game starts, it will start in the ready state, in which nothing will happen. We will tap the screen to start the game. 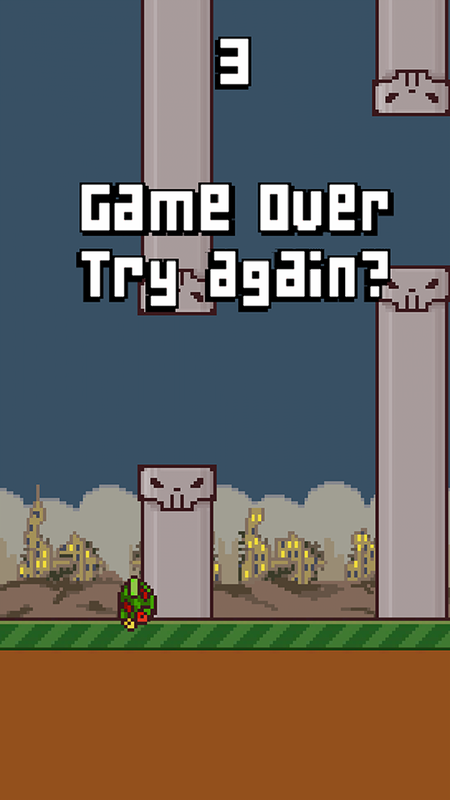 When our bird dies, we will enter the game over state, at which time we can tap the screen again to restart. No buttons yet, but it's a start! Now to make this more intuitive, we are going to make changes to the Game Renderer, displaying some useful information. Our gameplay is now finished. Let's wrap things up by implementing high score! The easiest way to store small data for a libGDX game is to use a Preferences object. A Preferences object maps key-value pairs. This means that you can store some key and a corresponding value, and you can pull the values out! Preferences prefs = Gdx.app.getPreferences("PreferenceName");// We store the value 10 with the key of "highScore"
prefs.flush(); // This saves the preferences file. The resulting value will be 10! 3. and flush (for saving). putBoolean("soundEnabled", true); // getBoolean("soundEnabled") retrieves a boolean. Let's implement this for high score. Open up the AssetLoader class. Now we can access the file prefs from anywhere in the game! Let's create some helper methods so that we don't have to deal with preferences outside of AssetLoader. Now we can go back to GameWorld and start saving those high scores!